OnPoint® Weather is available on demand via the OnPoint API ensuring immediate access to hyper-local global analytics grade weather data. 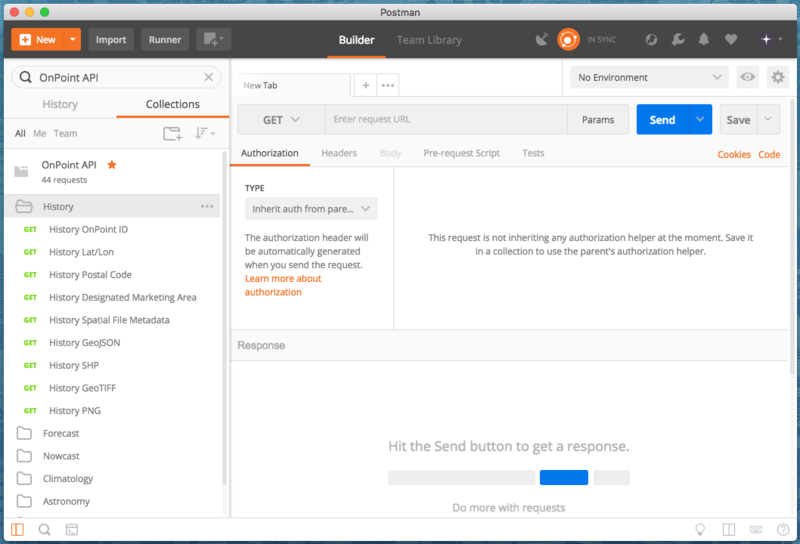 Postman is a powerful GUI platform for faster and easier API development. Download and install a copy of Postman from getpostman.com/apps. Once installed, click the “Run in Postman” button above. 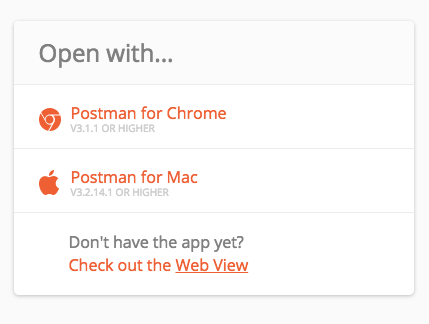 Select the installed Postman application (Postman for Chrome or Postman for Mac/Windows/Linux) from the prompt. Postman will open and import the OnPoint API collection. 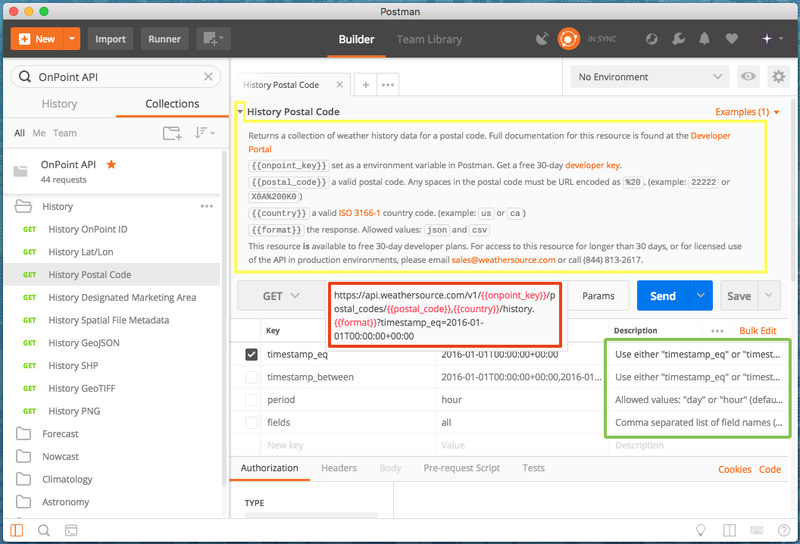 To use the OnPoint API collection in Postman, you need an OnPoint API Key. Get a free 30-day Developer Key at the Weather Source Developer Portal. Once you have an OnPoint API Key, store it in a Postman environment variable named onpoint_key. Follow Postman’s documentation to set up an environment with variables. 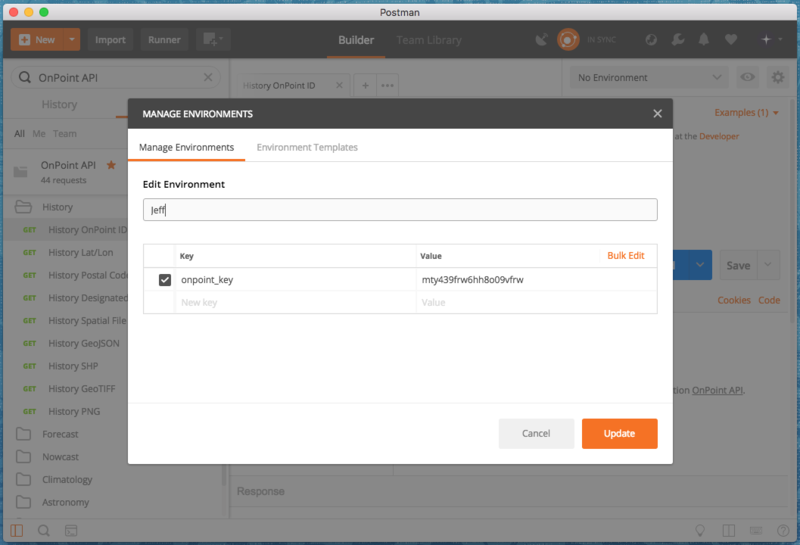 The screenshot below shows a Postman environment configured with the onpoint_key variable. If you need access to other resources, increased throughput allowance, or a license for production use, please email sales@weathersource.com or call (844) 813-2617. View full documentation for the OnPoint API at the Weather Source Developer Portal. Each request type may query by Latitude/Longitude, Postal Code, Nielsen Designated Marketing Area, or OnPoint ID. History, Forecast, Nowcast, and Climatology also have geospatial data in GeoJSON, SHP, GeoTIFF, and PNG formats. Open a folder and select a request. This screenshot shows the History Postal Code request. Page description (yellow) and parameter descriptions (green) provide limited documentation for the selected request. Detailed resource documentation is available at the Weather Source Developer Portal. The request URL (red) contains variables (in addition to onpoint_key). In this example, postal_code, country, and format should be replaced with values of your choosing. By default, values are set to 22222, us, and json respectively.